A family-run resort with a fascinating history, Hampton-on-Sea based Potters Leisure have been offering luxury accommodation and entertaining their guests for over a century. An award-winning 5-star holiday village, Potters Leisure resort spans 65 acres and is ideal for family holidays, weekend breaks, and romantic getaways alike. With bungalow accommodation as well as a 110 bedroom hotel, it’s no surprise that Potters Leisure take their catering seriously. 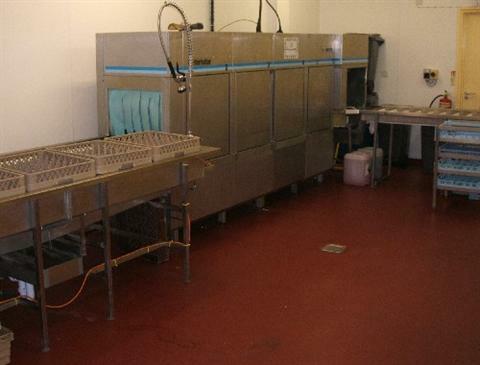 Six years ago, Caterquip were approached by Potters Leisure to supply a large reconditioned plate wash for their kitchen. Thrilled with the excellent condition and cost of the appliance, Caterquip has since taken care of Potter Leisure’s catering equipment needs, and have supplied a large quantity of appliances, from combi ovens to pass-through dishwashers. If you would like to find out more about Caterquip’s Reconditioning services, take a look at our Other Services page. Last year, Caterquip were approached by a customer who had recently taken over a restaurant and was working with a small budget to kit out the kitchen. A particular inconvenience was the existing Hobart oven which had certainly seen better days. Upon assessing the oven however, Caterquip advised that it would be more cost-effective to have it reconditioned rather than buying a brand new oven. The oven (pictured left) was in a dire state of repair and crusted in grease and old food. Once we had collected the oven from the customer’s premises, the entire oven was stripped down to the bone, given a deep clean inside and out. 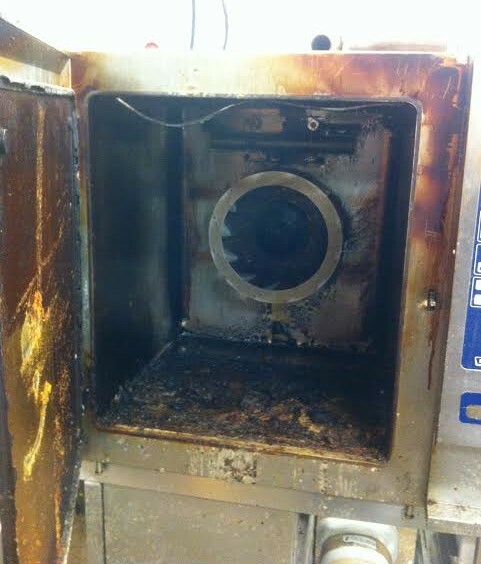 The oven was then checked for faults, and all faulty parts were replaced. The appliance was serviced and tested by our experienced engineer to ensure that it was safe and in good working order. 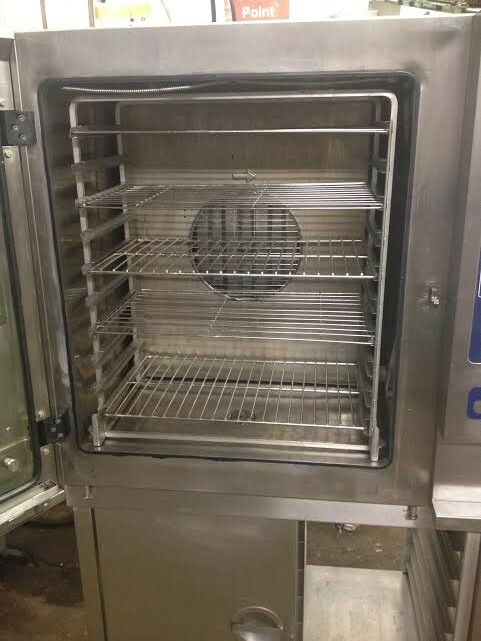 The project took a week to finish, costing £1,500 for the labour and parts, and the customer was thrilled when we delivered the sparkling oven back to their restaurant. By using Caterquip’s reconditioning service, the customer saved a phenomenal £7,000 against buying a brand new Hobart Oven (£3,500 against buying second-hand). For more information about our reconditioning service, take a look at our Other Services page. Please note that reconditioning is only possible for high-end brands such as Hobart, Falcon, Rational, Wolf, Foster, Williams, etc etc. 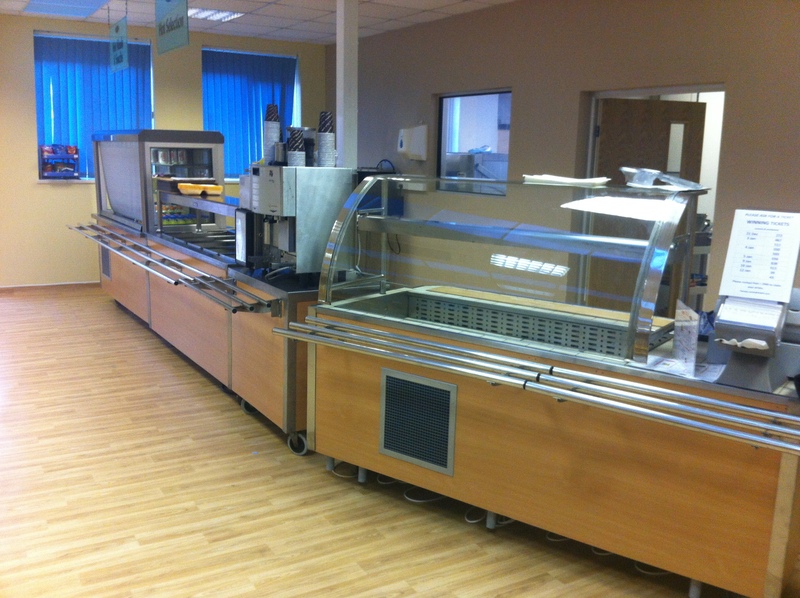 In March 2012, we were approached by Delphi Automotive with an idea to develop their staff canteen. A leading global supplier of technologies for the automotive and commercial vehicle markets, Delphi Automotive are a large company with many branches across the UK, and needed to enhance their canteen servery at one branch to operate more efficiently. 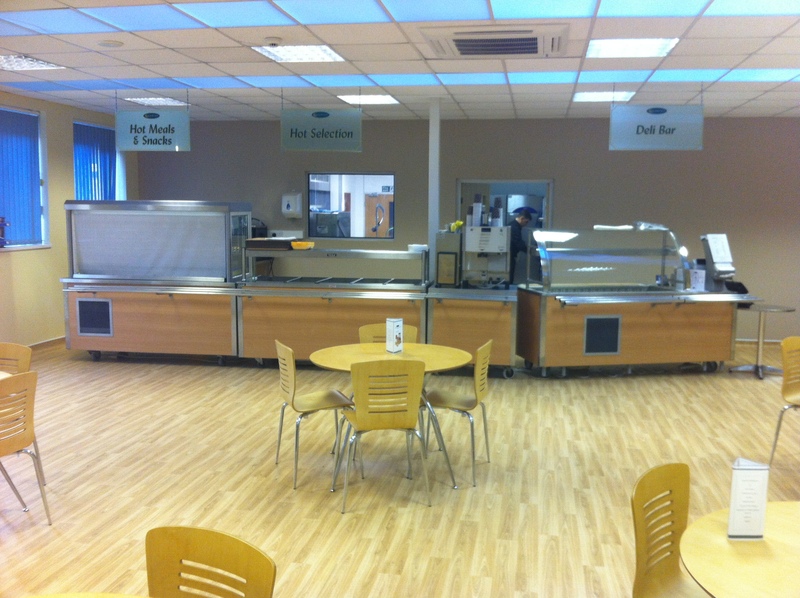 The customer visited Caterquip HQ with an idea to clad ordinary servery units to match their canteen décor. With plenty of pre-owned serveries in stock, we transformed three servery units into a fully functioning servery station. Each counter was clad in pine and fully serviced. An additional unit was added to house the coffee machine, and Caterquip also fabricated tray slides which were fixed to the front of each unit. Delphi Automotive were extremely pleased with the finished servery station. They were impressed with the great condition of the pre-owned servery units, and thrilled that the cladding fitted their existing décor. By using Caterquip rather than purchasing a brand new counter, the customer made a saving of hundreds of pounds too. In April this year, Caterquip were contacted by client Royalblue Executive Services to inspect a potential site for expansion of their current premises near Heathrow airport. Established in 2004, Royalblue have been creating and supplying fine cuisine exclusively for the executive jet industry. Using fresh, locally sourced produce, they cater for a wide variety of dietary requirements and transport the food from their catering premises directly to the aircrafts. With exciting new contracts and opportunities in the pipeline, the company had outgrown their premises and were looking to expand into an old storage facility, originally used for weapons and ammunition during the war. As seen in the photographs and video (below), the site was in desperate need of repairs with cracked flooring and rusting roof trusses. We understood it would be a challenge to project manage a task of this scale and build a commercial kitchen within the space – especially with high airline food standards to adhere to, but we could certainly see potential in the space and soon got to work. Pictured: the original internal structure of the old artillery facility, used as a storage unit. Armed with a tape measure, pencil, and paper, the team measured every inch of the site and produced a series of potential designs. Once the client was happy and the final design decided upon, we marked out the areas to the correct measurements on the floor in preparation for the next stage. To build a fully functioning commercial kitchen, our next task was to lay the structural foundations. Having first secured the floor tracking, we installed the internal walls constructed from PIR panelling to divide the space into separate areas. Polyisocyanurate – most commonly known as PIR – is made from a thermoset plastic which is typically produced as a foam, and is often found in roof insulation and vertical walls. The panels ensure that the internal walls are fire-proof, food-safe, and well insulated; ideal for a commercial kitchen environment. Although the client originally intended to construct the walls from building materials with a cladding finish, the PIR panels perform the same task and are additionally more cost-effective. We also installed production kitchen doors complete with vision panels and kick plates to create fixed divisions between areas. Next came a bigger challenge: installing the new ceiling. Due to the lightweight nature of the newly installed internal walls, the ceiling would need sturdy drop-support from the existing roof. Following an industrious two weeks, the internal walls and ceiling were all fitted and passed for safety. We then met with reputable flooring contractors, gas installers, electricians, and an extraction company to plan all electrical wiring, gas, and plumbing specifications which were fitted within three weeks. 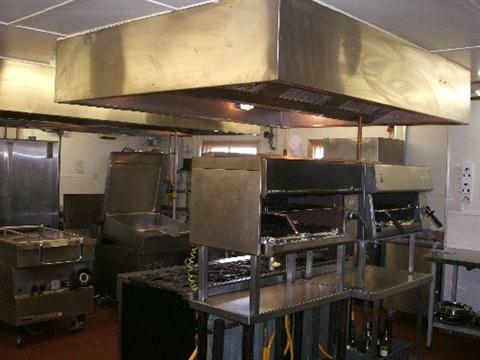 When it came to equipment installation, we firstly delivered and installed the cooking appliances, all of which were reconditioned. 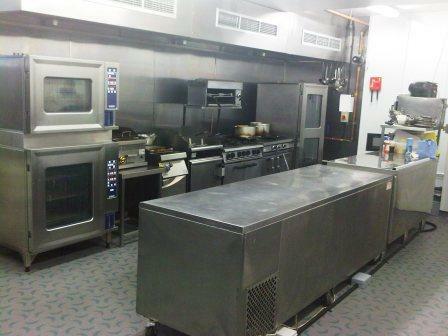 Appliances included a Falcon double gas fryer, a gas griddle from Electrolux, a Moorwood Vulcan 6 burner range, and a 6 grid combi-oven from Rational (pictured in image four). Our floor plan was designed to enable Royalblue’s kitchen staff to logically go from process to process with ease, from the removal of raw food from the fridge to the delivery of the finished produce to the airport. 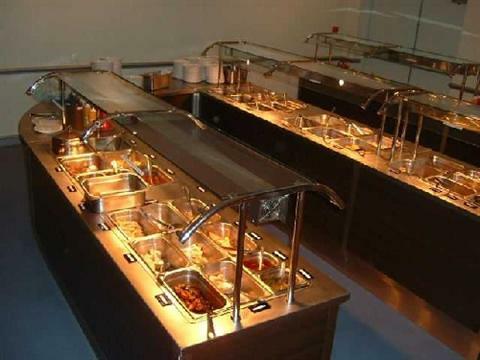 Caterquip supplied pre-owned storage racking and stainless steel preparation tables which were custom-made and positioned centrally for Royalblue’s chefs to work either side, thus maximising the floor space. 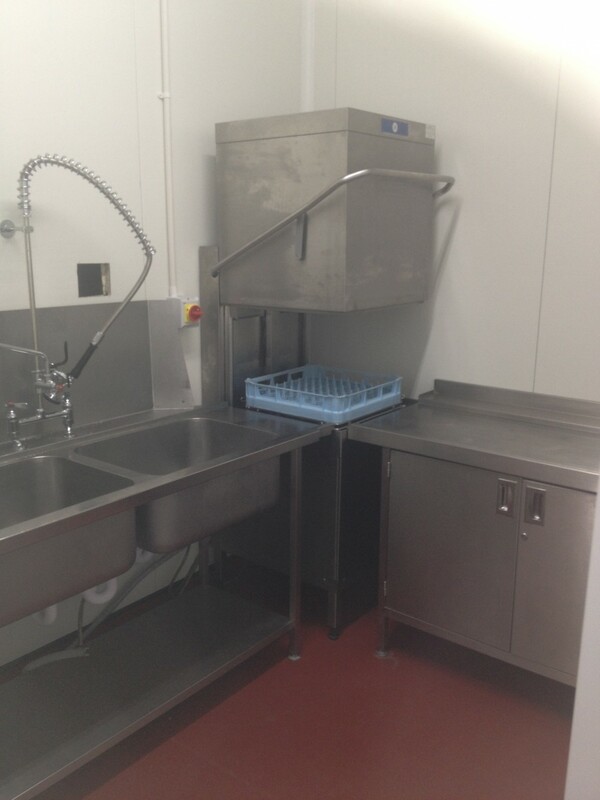 Essential to the daily operations of a commercial kitchen, the team fitted a new dishwashing area. 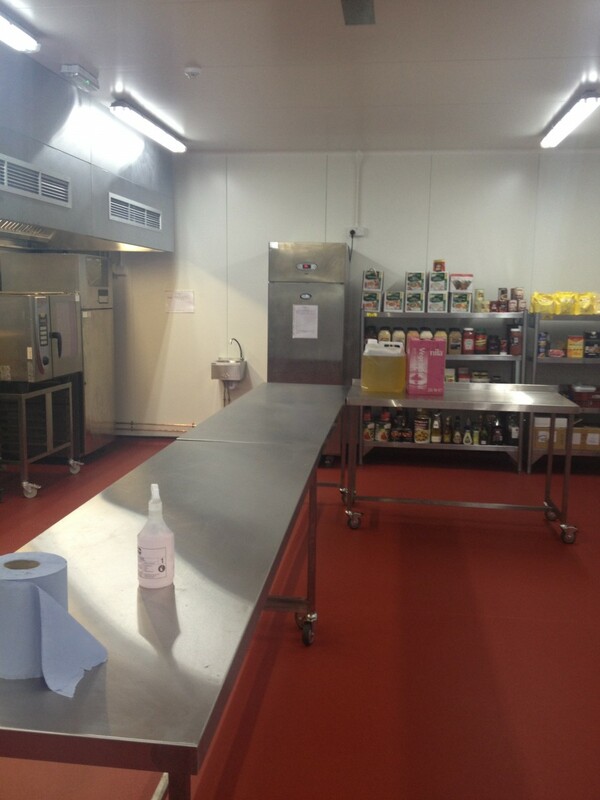 Complying with strict health and safety guidelines, we secured through the floor design that the dishwashing area was situated away from the cold room to ensure that raw food would not cross the path of any soiled dishes. We supplied a pre-owned sink which was cut to fit the space, pictured in image ten. Other dishwashing supplies included a dishwasher, exit table, racking space, and waste disposal for a practical solution for Royalblue’s cleaning process. 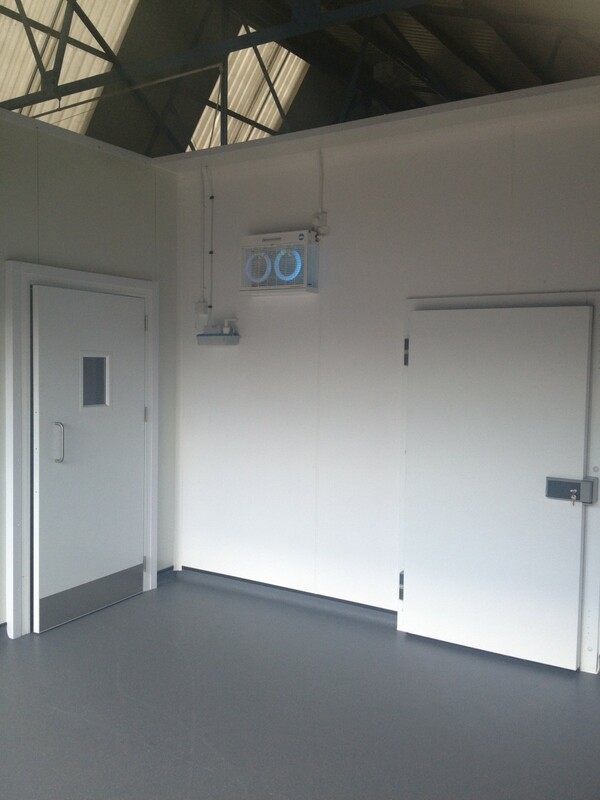 The cold and freezer rooms were built from pre-owned cold room panels, complete with brand new refrigeration systems. Previously a laundry room, the cold room was fitted off the main kitchen area so that food produce could be wheeled in with ease from the preparation area. 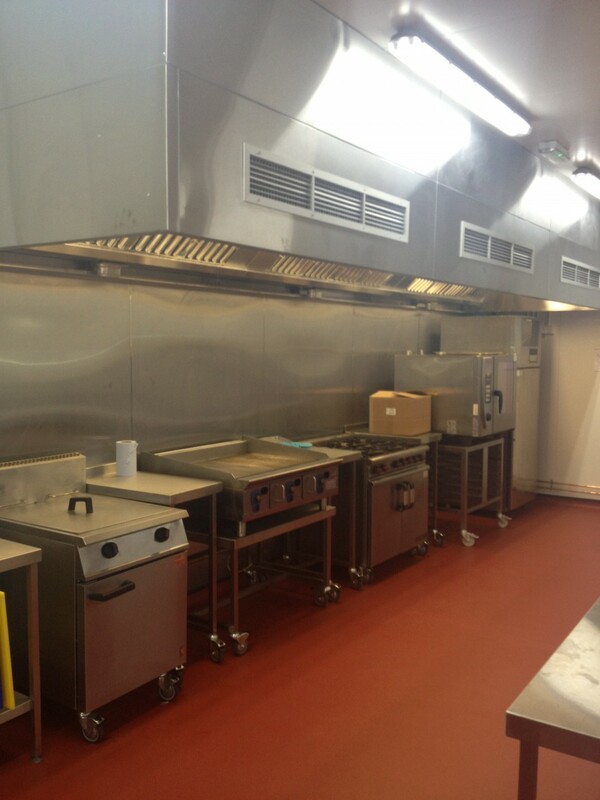 The final installation was the freezer room which was built to spec and erected at the rear of the unit. As a consequence of supplying pre-owned cold room panels instead of brand new, we were able to save the client almost £5,000. Royalblue were delighted with the finished result. 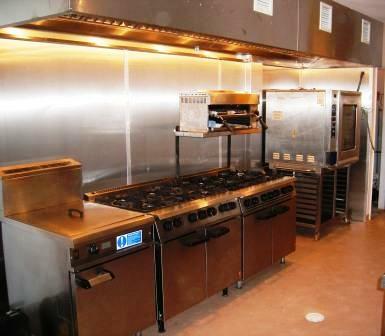 By fully managing the project from design to installation, we ensured that the process was hassle-free, and produced a good quality, efficient kitchen at an affordable cost by supplying pre-owned equipment. 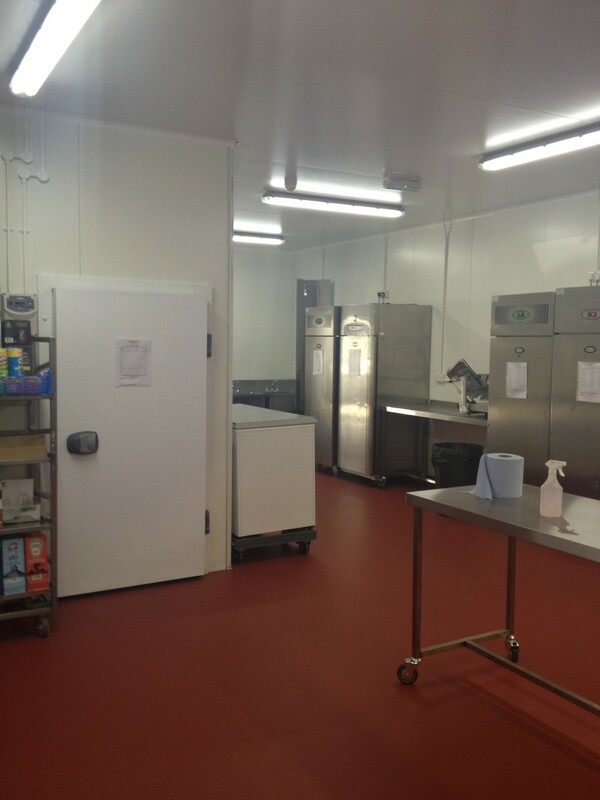 Abertillery Hospital’s walk-in freezer room was one of our more challenging projects. 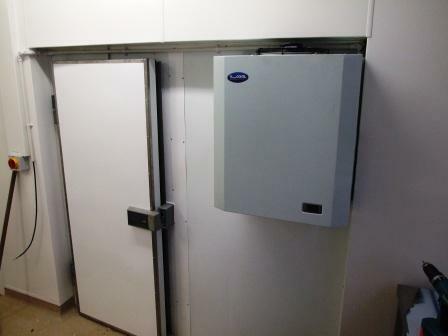 Working with a confined space which was formerly a storage cupboard, we installed a fully-specced freezer room, complete with a brand new, drop-in freezer unit. What complicated matters was the fact that the room was only twice as wide as the door, and the restricted opening (pictured left) imposed on our ability to manoeuvre with the equipment. The project was a great success and no limbs were lost in the process! 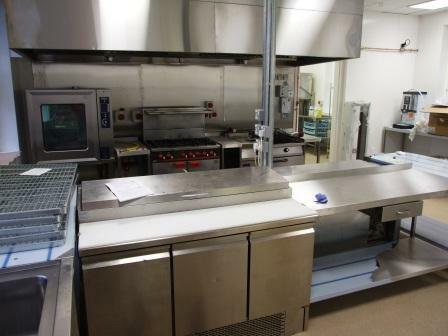 Caterquip were also hired by Abertillery Hospital to design and install a fully functional commercial kitchen within their listed building. 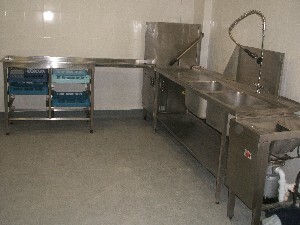 The equipment supplied to the kitchen (pictured left) was second hand and reconditioned, providing a safe and affordable solution which was well within the hospital’s budget. The extensive inventory included combi ovens, ware-washing, sinks, tables, refrigeration and walk-in fridges and freezers. We also installed an extraction system and wall cladding. The East of England Showground accommodates an impressive 800,000 visitors annually, and needless to say, catering is an important part of their operations. Caterquip were approached to offer an alternative solution to the ‘buying new’ quotes they had already received. The project, which included the installation of an extraction system, wall cladding, and walk-in refrigeration, would have cost the Showground an additional £50k had they selected the ‘brand new’ option. Caterquip also supplied the Showground with a Winterhalter dishwasher, an ideal conveyor system for large-scale operations. 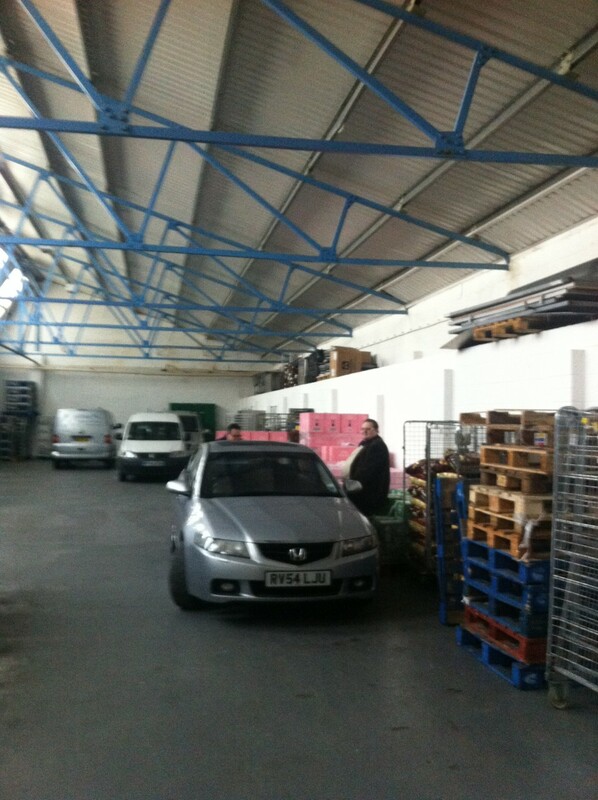 We were given an area to work with where our customer wanted their cold storage, we built these fridge & freezer rooms. These were all used cold rooms. we finished them off nicely with hygiene wall cladding. Caterquip Uk Ltd can build either bespoke rooms built to what ever size you need or we have standard size rooms as well. call our sales team for a quote. Winterhalter dishwasher system This is a Winterhalter conveyor dish washer system, we provided the pre wash system, arranged full delivery & installation. 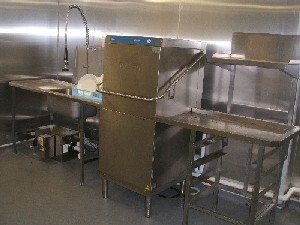 A very modern Hobart pass through system, with inlet sink, pre wash arm, grease guardian and an outlet drying table. We completed this project at a cost of £3750.00 to the client saving him over £2000.00. This is a Hobart pass through system using the superb Hobart AMX Pass Through Dish Wash. We provided a double bowl inlet sink unit with pre rinse spray wash arm, a waste disposal unit and the outlet drying table. The machine was set up as a corner unit, we arranged delivery & installation. We saved our client over £2700.00 on this project. We recently purchased several items of catering equipment from Ormiston and was very impressed with the work they do for young carers. So much so that Caterquip donated to the charity. Ormiston supports young people that care for poorly siblings or parents. These children dedicate much of their free time to look after someone close. Ormiston Trust gives them a friendly and stimulating break away from the home to be themselves and to share time with other hard working children with the same responsibilities. Caterquip wishes them well. This was a new kitchen set up that we supplied, the kitchen included a combination oven, 6 burner ranges, a falcon fryer, we supplied the dishwasher system and the prep items in the kitchen. We supplied some great quality equipment, some brands that may have been out of their range, and managed to save a lot of money for our clients at the same time !! This was a very comprehensive kitchen fit project involving a whole scope of kitchen appliances for a large scale and highly regarded event hospitality business. 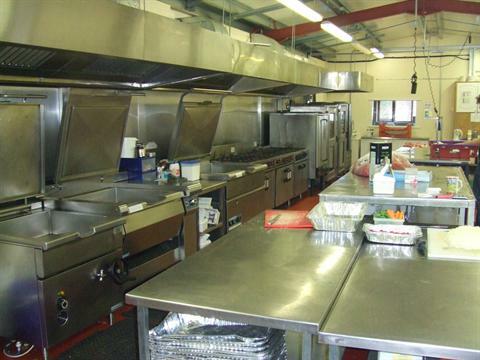 Caterquip UK supplied 20 grid combi ovens, large volume bratt pans, a roll-in roll-out blast fridge, a full pot/ware wash system and a large walk-in fridge. This was completed with a budget saving in excess of £40k against brand new.